5 Years a Survivor . . . Take That, Cancer! Five years ago I sat at my desk at work, phone to my ear, while my doctor told me the biopsy was positive, he was very sorry but I had colon cancer. That was a little after lunch. I called my wife, told her, and finished my work day. When I arrived home our pastor was already there, ready to pray with us and offer some words of encouragement and support. I have many memories of that battle, the surgery, the chemo, the doctor visits, ER visits, the depression, the fear. Most are bad, some are good. I lived through much I’d never want to revisit but I experienced many blessings as well. It’s funny how time affects your memory. Some of it I relive as if it just happened last week. Some of it is fading, becoming fuzzy and harder to dig out of the recesses of my mind. But even now, five years later, I think about it every day. Several times a day. They tell me five years is the magic number, that I’m cured now, but I still worry about it returning, still glance over my shoulder wondering if, when it will sneak up on me again. I know I shouldn’t, that I should focus on living the life I’ve been given. And I do. Cancer teaches you a lot of lessons and one of the most important is that life is precious, that each moment of life is precious, and that not one should be allowed to slip by. Life should be celebrated, enjoyed, lived to the fullest. Sometimes that makes for some tough decisions but if kept in perspective regrets will be far and few between. Three months after I finished my chemo and just two months after having my ileostomy reversed I ran a 5K in Philadelphia. After the run we walked over to the Museum of Art and my daughters accompanied me as we ran the same steps that Rocky Balboa climbed. I raised my hands above my head, Rocky-esque, and in my heart stuck my finger in cancer’s face. I’m still relishing that victory, enjoying every day, and praying God gives me many more. I want to squeeze everything I can out of life, make the most of it. I don’t always succeed at that but I’m sure trying. And I’m trying to inspire others to do the same. 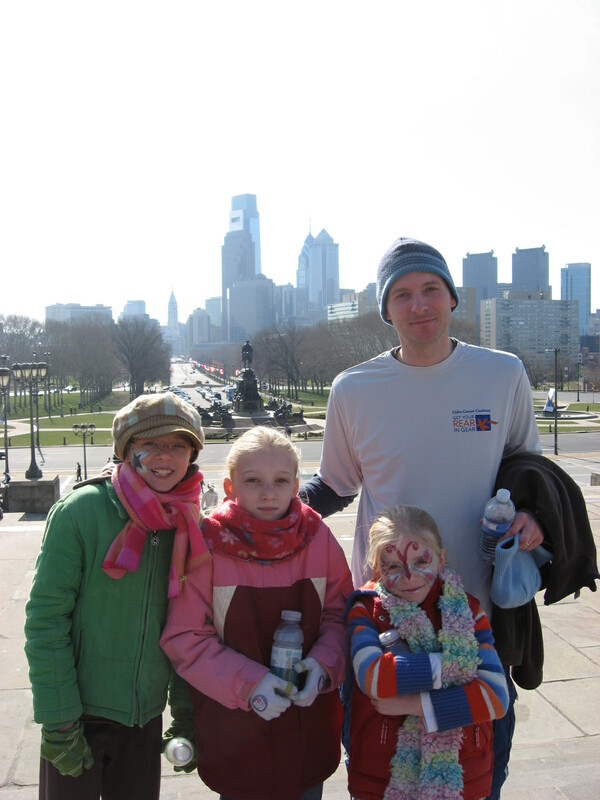 Posted on March 18, 2013, in Cancer, Family, Life in General and tagged Cancer, Cancer survivor, Colorectal cancer, Philadelphia, Rocky Balboa. Bookmark the permalink. 6 Comments. You always amaze me in what you write, what you went through and what you battled and your everlasting faith in God. It is something I envy in you, no matter what live threw at you, you still believed. Congratulations, Mike! Your honesty is refreshing. I understand, now, the thoughts that come and go, as my sister has mentioned similar statements about Eli, who is cancer free now for two years. God is faithful, and I see your faith in God shining through. I pray, too, for more years for you and my nephew, grateful to God all the way! So good to hear about Eli, Linda. My daughters still pray for him every night (and his brother). Blessings and continued good health and continued writing!!! Yes, as Lois says. Blessings and continued good health & writing. Fabulous that you’re grabbing each day and living it to the maximum. Mike, thank you for sharing this. You’re an inspiration! A 5K….really? Wow. Now I’ll share something, when I was 11 my mom was diagnosed with pancreatic cancer and the doctors gave her 3 months to live. But guess what? God always has the final say over life and death. My mom lived almost 20 years more. It’s not over till its over, so live abundantly fully daily;) GOD BLESS U MY BRO.